Working as a truck driver with a current commercial driving license in good standing provides a stable, enjoyable, well-paying career. But what if you could increase your earnings on every load you haul? What if there was a relatively simple path to a bigger paycheck? One of the best methods to growing your presence and securing a high paying truck driving job is to become a more valuable asset to a trucking company. One of the most important attributes trucking owners look for is a driver with multiple endorsements. Class C: This group includes any single vehicle or combination of vehicles that does not meet the definition of Class A or Class B, but is either designed to transport 16 or more passengers, including the driver or is transporting material that has been designated as hazardous. Class C drivers are typically bus drivers or those hauling passengers rather than freight. After one has received their CDL for a commercial trucking job they can continue to boost their CDL status by getting a variety of endorsements. Getting a commercial driver license is similar to getting a regular driver license.And just like a standard driver license, a CDL offers different classes and endorsements. An endorsement in addition to a CDL provides authorization to operate different types of vehicles and cargo. Unlike the situation as it pertains to many other jobs, an endorsement in the trucking field does not relate to the accolades or rave reviews you receive from your boss or customers. Yes, such recommendations are important and helpful to one's career, but an endorsement in the trade refers to additional licenses that show the diversity and expertise of the driver while broadening employment opportunities. According to the Federal Motor Carrier Safety Administration (FMCSA) which is the agency that regulates the trucking industry in the United States, there are a variety of endorsements that can be acquired through different testing. The penalties for driving without the appropriate endorsement are harsh and include monetary fines and suspension of your license, so one should be sure to acquire the proper endorsements needed for your runs before accepting them. 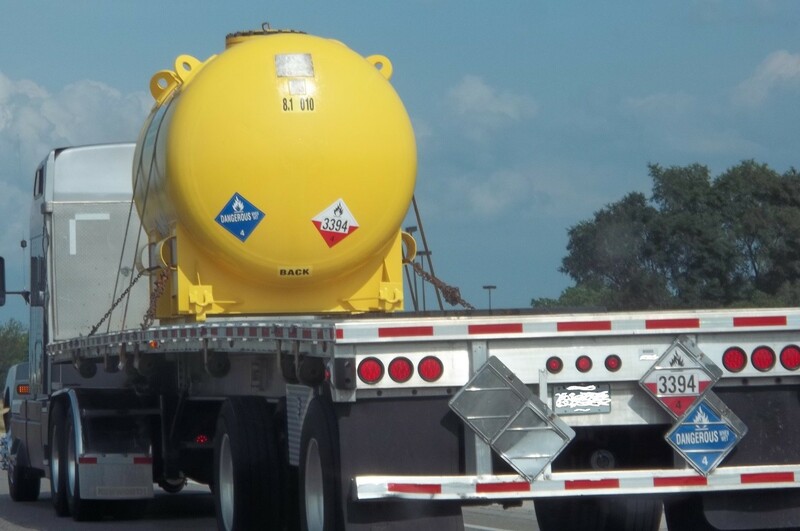 This relatively new regulation from the Federal Motor Carrier Safety Administration (FMCSA) requires drivers who are hauling large amounts of gaseous or liquid freight to obtain a tanker endorsement on their commercial driver’s license. Tankers are easily overturned and can be especially difficult to handle at higher speeds. Understanding how weight distribution affects performance and safety is essential. One should have knowledge pertaining to stopping in an emergency situation and what you should do if you’re involved in an accident. In the walls of the tank are small holes known as baffles. These allow liquid to flow throughout the walls and move freely in the tank. The purpose of baffles is to ensure that the fluid is evenly distributed.You will likely be tested on how baffles work and their limitations. Because these big rigs are filled with gas or liquids they have a higher center of gravity. Therefore, it becomes especially difficult to slow down. 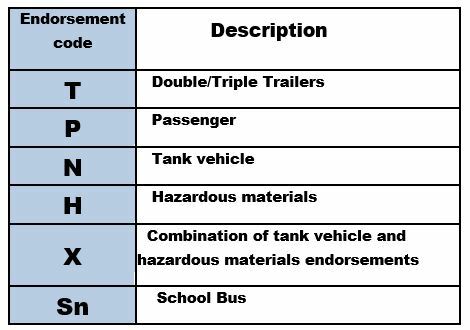 If you’ll be transporting hazardous materials via a tank, then an “X” endorsement that combines hazmat and tanker endorsements will be required. It is this type of endorsement that is mandatory for transporting materials such as gasoline. This endorsement requires a hazmat tanker test. You’ll be asked to show proof of U.S. citizenship or legal permanent resident status. And much like the HazMat endorsement, a driver must pass a TSA background check. Passenger “P" endorsements are required to drive passenger vehicles that can carry at least 16 passengers. Jobs such bus driver and airport shuttle driver are examples. The P endorsement assures the driver is skilled in loading/unloading passengers, responding to emergencies, handling troublesome passengers, and other tasks specific to carrying passengers of all ages. S Endorsement - This permits the operation of a school bus. There is both a written and road skills test. To earn a school bus “S" endorsement, you must first qualify for a passenger “P" endorsement. A driver may not apply for the "S" at the same time they are applying for a "P" endorsement. Apply for a commercial learner's permit with the P and/or S endorsements. It is not unusual for some school districts to also require separate background checks for employment that involve their community’s students. Getting endorsements demand an investment of time and some money. However, there are powerful reasons for one to embrace the process of earning them. Drivers who earn these endorsements are eligible for a greater assortment of loads and specialty endorsements allow individuals a constant variety of options in what they haul. You’ll avoid any type of boredom and become a key asset to any employer with these bonus skills. 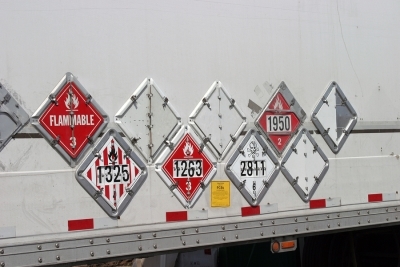 Additionally, loads involving hazardous materials pay much better than regular loads due to the perceived risks involved. Overall, the decision to get endorsements comes from a place of a driver who wants to better their professional lives by equipping themselves with skills that make them more competitive. As truckers are often continually learning every day they are on the road, endorsements are yet another avenue for a driver to educate themselves and truly show their value on the road.